Idealy set in Uzès, luxurious silk farm in stones of 450qsm, totaly remove whis noble and authentic materials included a huge main entrance who disserved a one level master suite whis two shower rooms and a dressing . A laudry, a garage, a spacious living room very lighty of 100 sqm and his kitchen goes to a inside garden of 750 sqm, a huge paved terrace whis shadow and a wonderfull swiming pool aréa whis out face to face. 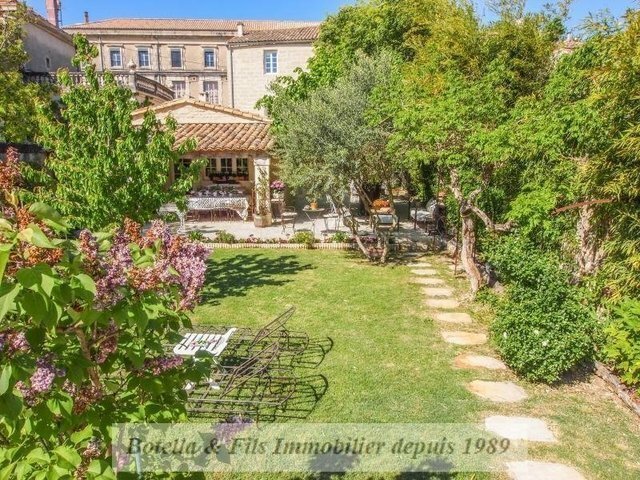 At the first floor you will find a second appartement whis two bedrooms and a office and at the second floor , a loft whis shower room and a fantastic terrace whis a incredible view on the castle of Uzès. Réf 10398.